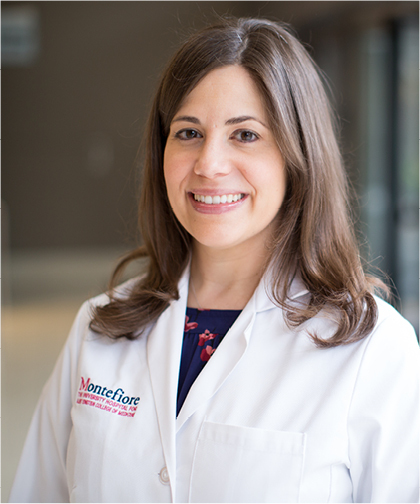 Melissa Laudano, MD is an Assistant Professor of Urology at Montefiore Medical Center and Albert Einstein College of Medicine. Dr. Laudano specializes in female pelvic medicine and reconstructive surgery, as well as minimally invasive and robotic surgery. Dr. Laudano received her bachelor of science degree in Biology from Tufts University and her MD degree from the Columbia University College of Physicians and Surgeons. She completed her surgical internship and urology residency at Weill Cornell Medical College/New York-Presbyterian Hospital. After residency, she completed a fellowship in Female Pelvic Medicine and Reconstructive Surgery at Montefiore Medical Center. Dr. Laudano's research has focused on disorders of the female pelvic floor, including urinary incontinence and pelvic organ prolapse. Her translational research is directed at elucidating the mechanisms that lead to the development of bladder dysfunction in men and women. She has received awards, including the Distinguished Housestaff Award at Weill Cornell Medical College/NewYork-Presbyterian Hospital, the Resident Travel Award from the Society of Urodynamics, Female Pelvic Medicine & Urogenital Reconstruction, and an Award Winning Video from the American Urological Association. She is a member of the American Urological Association.